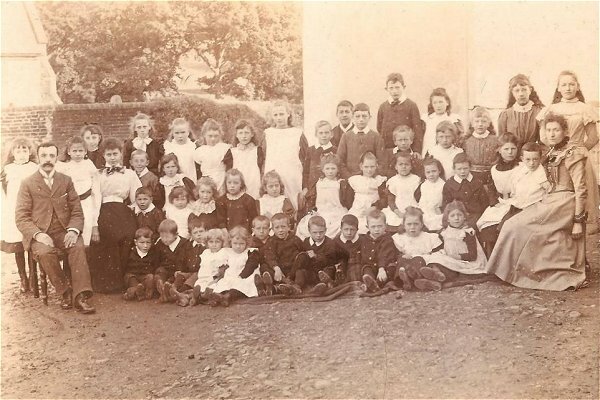 The following is a list of links to school photos - whole year photos, class photos, group photos, team photos and staff photos, generally before the 1980s. Because most are large images, each link opens a new page (and watch out for a horizontal scroll bar across the bottom of the page). If you have a pre-1980s school photo to share, please contact me (see page bottom). I've been sent this photo asking if anyone can identify the school or anyone in the photo? It was taken by photographer FG Christopher of Crewkerne & Yeovil but with no other info. From the top left of the photo it appears the school is next door to a church and graveyard. From the schoolmistress' dress with 'leg of mutton' sleeves it would have been taken in the 1890s. Any ideas? Please contact me.